Technology, digitization, process automation. Flowinn‘s Logistics WMS solution transports your business into the future. 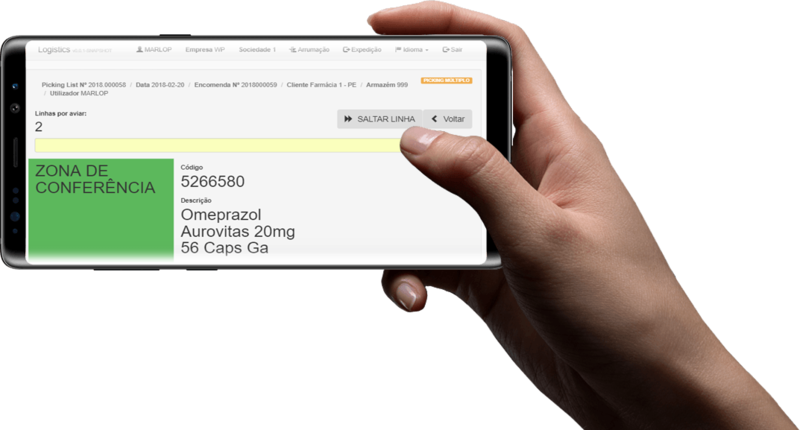 Instead of issuing picking lists and the warehouse operator writing down on paper the quantities that he actually took off the shelf, the use of mobile devices and scanners allows immediate validation that the operator is in the right place and has the product ordered in the correct quantities. At the same time, the quantities are updated in your ERP, immediately. Create packing lists that ensure the products are tidy the way your customer wants them. If the operator has made a mistake, he can be warned that the volume where he placed the product does not comply with the volume specified by him. Decrease complaints! The era of scanning brings the ability to have information anytime, anywhere. Customers are becoming more demanding with delivery times. Make available, through an online Portal, the status of your customer’s order. Spend expectations and ensure customer satisfaction. The traceability of products in the warehouse is increasingly a factor of quality. It is either because by measuring it is possible to improve processes, either for regulatory requirements. Make sure that all your movements are tracked and tracked whenever you need them. Make sure you have control of what is happening in the warehouse. Know what is being shipped. Check that you have your orders up to date and that your customer will have the order within the agreed deadlines. Through the voice commands it is possible to interact with the solution without any need for manual data entry, use of paper, radiofrequency collectors, etc. The software receives and communicates only through voice. Ensure compliance with good distribution and logistics practices as well as new accounting rules. Implement the permanent inventory in your company. Whenever a discrepancy is detected between execution and expected, create audit issues for inventorying the product. One of the great challenges of logistics is the optimization of the space available to stock product. If there are perishable products the risk of loss of good will increase. Whether to ensure the best routes, minimizing shipping time, preventing inventory loss, or otherwise, working with optimization models is the right step in ensuring the maximum profitability of your warehouse. Decide between single picking or multiple picking depending on the order you have to ship and the resources you have available. The “Skip line” feature (only available in multiple picking mode) allows its operators not to wait for their colleague to leave the aisle. Optimize the route of the warehouse operators ensuring that they do not get in the way, going the same route together. Ability to measure warehouse load, noticing whether defined metrics are being met. It allows to manage the productivity of the warehouse. In activities that justify it, robotics / automation can be a great added value solution to increase effectiveness and efficiency. In case of subcontracting of the distribution of the goods, communicate electronically the necessary data for the transport (number of volumes, weight, data of the point of delivery). The Logistics WMS application is subdivided into 5 modules: Reception, Storage, Shipping, Audit and Control.